Detail : This DVD collection has just about every Sgt. Pepper related film and music piece gathered together on one dual layer DVD. An incredible five and a half hours of Beatle music and video ! See below for the breakdown of each of the sections. This was an official documentary shown on television featuring George Martin taking us through the album tracks and Paul, George and Ringo giving us their memories of the sessions. The Making Of Sgt. 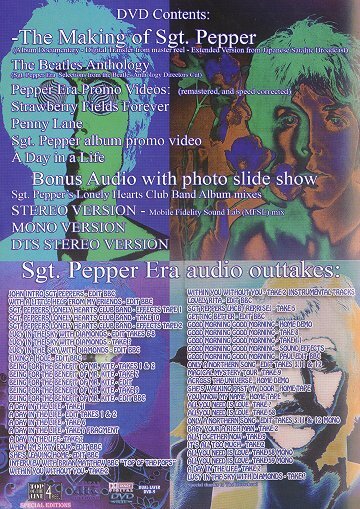 Pepper was transmitted in the UK on ITV on 14th June 1992 and featured separate interviews with Paul (filmed on 9th April 1992), George (12th April) and Ringo (19th April). The show also features George Martin playing some unreleased Sgt. Pepper's recordings directly off the original studio 4-track master tapes. Although great to see and hear with great sound quality, this feature is rather spoilt with Japanese sub-titles throughout. Plenty of fans have the original broadcast on video tape in just as good picture quality (I know I do). These familiar promotional videos are in excellent quality ... but ... they are mixed into each other and therefore miss some start and end sequences. 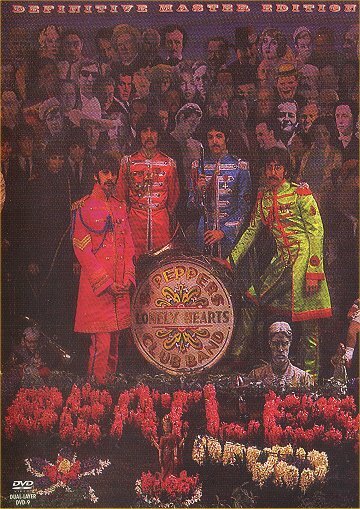 Pieces extracted from The Beatles Video Anthology that feature the Sgt. Pepper era. This is the full album from start to finish in it's original Mono Mix form. As the album plays, the DVD does display an interesting set of still photographs from the era. This is the full album from start to finish in the Mobile Fidelity Sound Labs Stereo Mix form. This is the full album from start to finish in a Digital D.T.S. 5.1 Mix. This mix is absolutely stunning. Even if the rest of the disc was blank, this mix would be worth it on it's own. It is in awesome 5.1 full D.T.S. sound. I didn't think such a mix existed (? ), how the heck can the bootleggers have possibly concocted this without having access to the master tapes. I was stunned at how good it was. Whoever was at the controls of the mixing desk made some great choices with voices being mixed just right for the music involved. The bassline is fabulous. There wasn't one part of it I could criticize. Except .... why on earth hasn't there been an official issue in this form ? I have read many arguments about the number of channels available in the original tapes, but listening to this DTS mix blew that argument right away. This is a large collection of previously bootlegged audio outtakes from the appropriate era, that have been added to with some extracted from the "Making Of" documentary heard earlier on this very disk in the above. ©2006 Graham Calkin's Beatles Pages. All Rights Reserved.